It is the simple solution for vine weevil control in your garden. The larvae are the plants killers feeding on roots and leaves leaving distinctive crescent-shaped notches. Larvae are feeding on fuchsia, primula, begonia and most evergreen which have fleshy roots. Strawberry and Raspberry plants are particularly favoured. For serious infestation treat in the spring and autumn. -Apply with a watering can to the moist ground around the roots and pots. -Minimum soil temperature is 5°C (40°F). -Application months: March-October. This is when the vine weevil larvae are present. 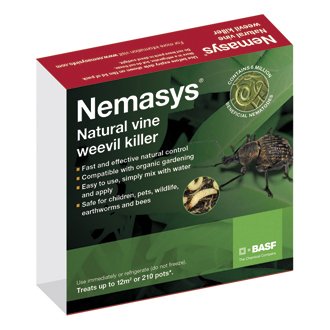 If applying under cover the pest’s life cycle is broken and Nemasys Vine Weevil Killer can be applied at any time, as long as the soil is warm enough. Treats up to 12m² or 210 pots.